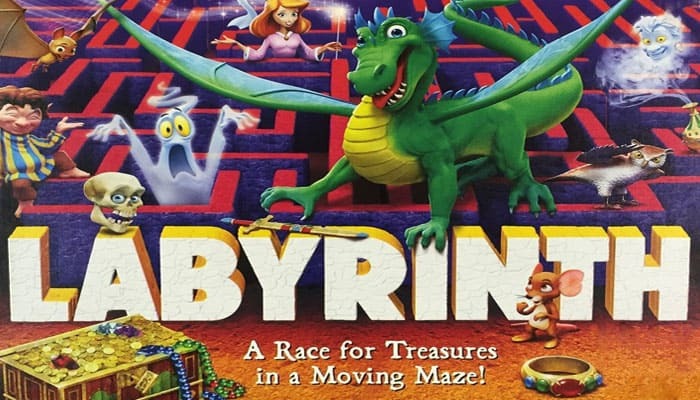 Labyrinth (formerly The aMAZEing Labyrinth) has spawned a whole line of Labyrinth games. The game board has a set of tiles fixed solidly onto it; the remaining tiles that make up the labyrinth slide in and out of the rows created by the tiles that are locked in place. One tile always remains outside the labyrinth, and players take turns taking this extra tile and sliding it into a row of the labyrinth, moving all those tiles and pushing one out the other side of the board; this newly removed tile becomes the piece for the next player to add to the maze. 12 maze cards have an encrypted message on the back that helps players to reach their goals faster. These messages can only be found on the 6 maze cards that show a straight path or the 6 that show a right angle path.